The marketing side of sports is banking hard on origin stories of late. Obviously, cute babies help too. 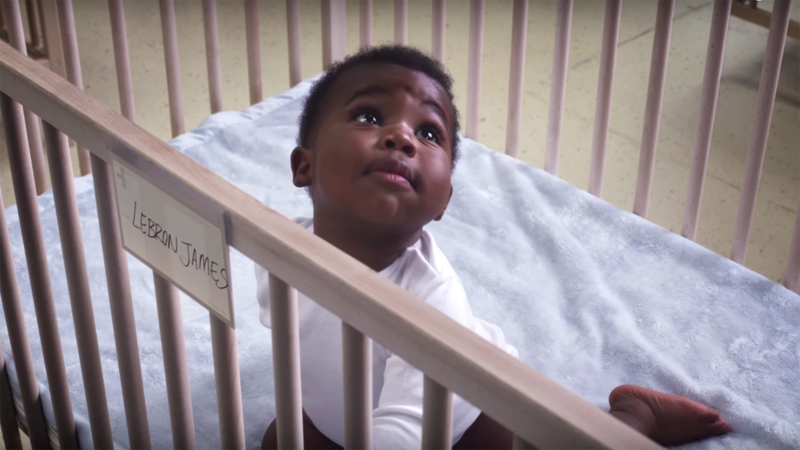 Nike's "Unlimited Future," by Wieden + Kennedy, opens on a nursery full of future sports stars, including diaper-clad LeBron James, Serena Williams, Neymar, Zhou Qi and Mo Farah. The babies gurgle to the faint music of Chopin's Berceuse, Op. 57, playing from a plastic radio. Then the door swings open. Brusquely. A man in a suit and leather shoes stops the jam, and the crowd goes silent. It's actor Bobby Cannavale. And he's shaken off the stale mothball stink of Vinyl. "Listen up, babies!" he growls, before kicking off the motivational speech that will shape these tiny future-athlete brains in ways that would make Freud fist-pump (as a lone baby does, at the very end). Have to say, Cannavale gives good speech. He pulls no punches, beginning with the one fact that precedes all others: "Life's not fair." You get no say in the world you're born into. You don't decide your name. You don't decide where you come from. You don't decide if you have a place to call home, or if your whole family has to leave the country. (Yeah, it's messed up.) You don't decide how the world judges a person like you. You don't decide how your story begins. But you do get to decide how it ends. A baby rises to its feet. Cannavale tilts his head toward him. "Yes!" he shouts. Then there's the beat-drop, and roll to copy: "Unlimited Future." It's an elegant, simple ad that's wily in its storytelling. The tricks are clear: You've got a TV face and a room full of babies. But its persuasiveness rests on the conviction Cannavale pours into those words, and the muttony faces of all those complacent tots, who seem to react as he punctuates hard truths. No baby talk here. Life is harsh, it won't coddle you, and there is no one to blame for the fact that you'll face stuff you didn't ask for and probably don't deserve. But you can still decide the outcome of your own adventure, and sometimes knowing that makes the difference. That message thankfully doesn't take itself too seriously or lean on the sense of manifest destiny that so often infects the athlete origin story (from Usain Bolt's preternatural speed to Ronda Rousey's youthful affinity for judo)—apart from name tags, no evidence suggests any child is more talented than others in the room. They're just babies, taking what won't be their first hard knocks. And though we know this is a ridiculous fiction, it may tint our sense of who those athletes are. Because in the real world, they're not just stars; they're gladiators—people who, like us, relearn those lessons every day while trying, by the force of their own bodies, to carve paths out of the deep trenches of circumstance. It almost feels like Dickens. If Dickens were concise, and wanted us to buy Flyknit.